Do you pick the fattest book from the library so that you can just sit and read all day? Do you feel lazy to pick up a glass of water for yourself even when you are a little thirsty? Do you look at the mirror and know that you are going a little extra in some places but just ignore them, convincing yourself that you will slim down once you start working out? And do you always resolve that you will start working out regularly from the next day onward? 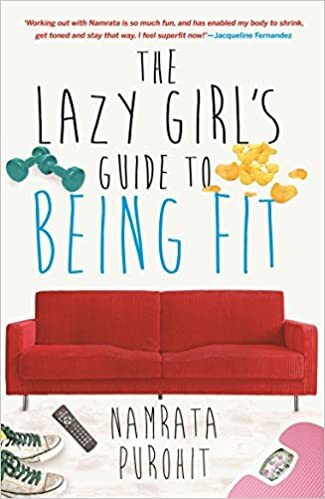 Well, Namrata Purohit’s ‘The Lazy Girl’s Guide To Being Fit’ basically asks you to stop thinking too much about it and rather start moving. That would show better results, really, and then you can still read your fat book! So, what should we be doing? The first thing, the book says, is start! Dance, jump, run, kick, play, walk, squat, stretch- just do something! You won’t and can’t lose all your extra fat in a month. But you surely will- gradually. Namrata, in the book, asks us to have SMART goals: simple, measurable, achievable, reasonable and time-bound. The book discusses various exercise routines, and also talks about a healthy balanced diet and the benefits of exercising. It talks about motivating yourself. Start, and you won’t stop, the book says. It gives tips as to how to continue some workout routine even on long holidays. Oh gods, no! Let’s start today. Let’s start now!